to digital materials. This creates new challenges. For instance, we have to provide the digital materials in forms that are useful to many different communities, such as technology professionals, data scientists, librarians, and humanities researchers. Each of these professions (and more) are working in various ways to come up with digital curation solutions. Professional conferences are typically a meeting of the minds of people from a single profession. This means that different communities are each coming up with their own digital curation solutions in a vacuum and missing out on the benefits of collaboration. The unconference format addresses this flaw. Unconferences tend to be based around a topic area rather than a profession. 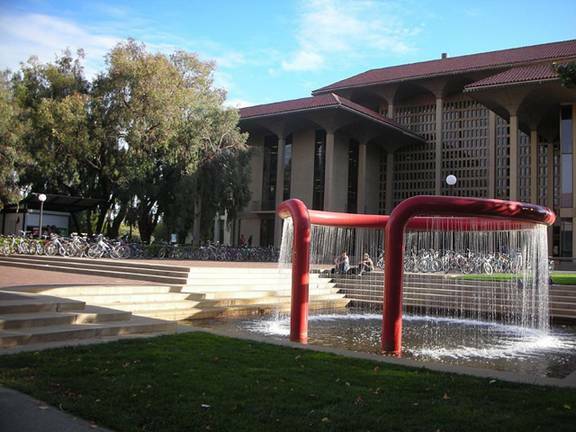 I recently funded my own attendance to CURATEcamp 2011 at Stanford University in Palo Alto, California. CURATEcamp defines itself as “a series of unconference-style events focused on connecting practitioners and technologists interested in digital curation.” The themes of each session are provided by participants rather than set in advance: as of the first morning, the schedule was an empty slate. First, we learned the informal procedure of the event, which was a challenge for some of us who are used to highly structured professional conferences.. After this introduction, the organizers asked us to go away for coffee, talk to each other and then come back with our ideas to fill in the schedule. The blank schedule on the whiteboard was daunting at first and it changed several times over the course of the two-day event, but these are the sessions we came up with. If you follow the link, you’ll find that some attendees linked their notes from the session to the schedule grid. As Declan Fleming, the director of IT at the University of California, San Diego Libraries and an organizer of CURATEcamp, said, the fact that the sessions shifted a lot because there was too much content we cared about was a good thing and evidence that this kind of unconference works. You can find descriptions of session ideas (some that happened and some that did not) here. We filled this in as a group in the session that Peter Van Garderen led about the future of digital curation. Cal and his colleague and postdoctoral Research Associate, Kam Woods, are leading researchers in using open source digital forensics software for digital curation of archives. This session explored the nature of disk images as objects to be preserved rather than mined for their content and discarded. This session was an overview of what major strategies for digital curation have emerged over time and whether there was a way to evaluate the effectiveness of these strategies. The overall response was that digital curation practitioners need to place more importance on gathering empirical data about their methods so that we can better determine the best solutions together. My biggest takeaway from this session was that while every practitioner’s institution had its own stack of tools for doing essential curation tasks, the overall goals were the same. Therefore, collaboration can be better achieved by focussing on end goals rather than the means to those ends. Then, every institution can decide to what extent they can provide their services and work towards developing appropriate solutions with other institutions who are providing the same levels of service. Jenn led a discussion about how we are all challenged with bringing in digital content from multiple sources. Together, the group explored whether we could use one common architecture as the foundation for our processes for dealing with all those disparate materials. I led this session because of challenges that we are facing at the City as we are about to embark on our first experience providing access to born-digital materials in the reading room in 2012. The discussion asked: During description and at the point of reference, how do we identify records in any given set that have donor-imposed, copyright or privacy restrictions? When analyzing and providing access to a large record group (at presumably any level of archival description) what is the best way to protect our donors, third parties and private citizens while still providing as much access as possible? This session focussed on looking at new ways of managing information about digital holdings (metadata). While archivists and technologists participated in all the sessions, this one in particular illustrated how much their interests and concerns intertwine. There are some great notes from the session here. Here at the City Archives, we’ve been working with Peter and his team for a while building our digital archives system. In this session, he introduced the next developments coming to Archivematica and got recommendations from the group about what else they would like to see in the software. We discussed use cases, requirements and design options. 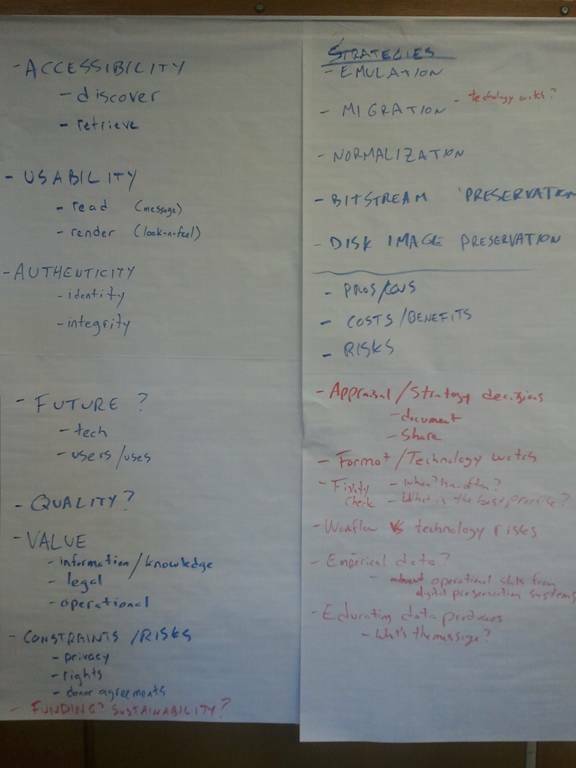 Mike led a brainstorm session asking each attendee what solutions, if any, their institution has for controlling versions of digital objects, and whether GitHub would be a useful solution. archivists; and innovative collaboration strategies. Institutions participating in data curation need to share successes and failures so we can all move forward together. We all need to collect empirical data about our processes so we can evaluate what we do and estimate the risks involved in our strategies. Open source digital forensics and visualization tools may soon offer innovative solutions for many of our current challenges. We have to be completely transparent with our stakeholders (researchers, donors and staff) about the level of services we can provide as we develop our processes for dealing with digital materials. Social media played a special role in keeping us all connected during the unconference. While I was in one session, I could follow tweets about other sessions if they included the hashtag #curatecamp. Attendees set up Google hangouts and Skype calls so that people who couldn’t be there in person could virtually attend. There was also a wiki and online chat that kept us all connected and organized. These kinds of connections empower collaboration and can help us all do our jobs better, so I hope that all kinds of conferences build on these ideas for sharing in the future. This was my second unconference ever, as I also participated, fully funded by the organizers, in the AIMS Symposium unconference in May at the University of Virginia in Charlottesville. Attending both reinvigorated my own passion for digital curation as well as my confidence in the innovative work we do here at the Archives. This entry was posted in Archivy, Digital Archives, Preservation and tagged AIMS, Archivematica, CURATEcamp, digital curation. Bookmark the permalink.